Reverse Tuck Folding Cartons have a pye-lock tuck for positive locking. Meets or exceeds PPP-B-566 federal specification. Die-cut from .024 fibreboard. Shipped flat to save space. Sold in case quantities. 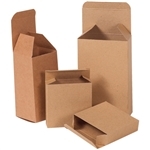 These light-weight cartons are perfect for small parts..
RTE W210 - WHITE Chipboard Reverse Tuck Carton - - 2" x 2" x 4"